Successful small businesses are known for their ability to manage money efficiently. This includes collecting on outstanding debts, increasing sales revenue, and learning how to stretch every outgoing dollar. 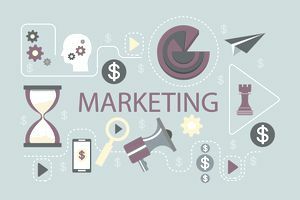 While owners of small businesses are comfortable budgeting and bootstrapping most areas of their company—digital marketing is one area that alludes many. In an increasingly global marketplace, small businesses are now being asked to compete with larger organizations like never before. Marketing budgets for small businesses were once a luxury, with many relying solely on repeat customers and word-of-mouth. However, small businesses that are not marketing themselves efficiently online in 2018 and beyond, will struggle to survive. Fortunately, you can increase your small business’ digital marketing efforts without breaking the bank. Here are 55 free marketing tools to help you grow your small business online. To market your small business online, you first need to make sure your business is visible to consumers where they spend their time. There are a variety of online communities and business listing services that make it easy for businesses to showcase their products or services while also engaging with consumers. 1​. Google My Business is a free tool from Google that helps small businesses increase their visibility on Google Search and Maps. You can create and customize your listing while also interacting with customers through reviews, post updates, images, and Q&A. 2. Facebook is arguably the most important online profile you can create for your business, with roughly 1.45 billion global active users every day. You can create a free business profile, share updates, promote products, message consumers, and pay for upgraded features. 4​. Twitter is a free social networking site where small businesses can share updates, grow their network, and interact with consumers. With more than 330 million monthly users, Twitter provides a huge marketing opportunity for small businesses. 5​. Yelp is an online community for business and consumer interaction. With more than 142 million users a month, Yelp offers small business owners another free listing resource to reach and engage with consumers. 6​. LinkedIn is one of the most powerful business-to-business social networking sites. Small businesses can create a profile, share updates, join business groups, and network with other professionals. 7. Yahoo partnered with Yext to create a paid service for small businesses to manage their listings across many online platforms—but, they also have a free option to claim your business and submit basic information like your name, address, phone number, email, and other descriptive information. 8. Yellow Pages is a familiar offsite business listing service that also has an online business directory that receives almost 60 million monthly searches. You can set up your small business listing for free and access paid upgrades for more visibility and engagement. 9​. Craigslist is an online marketplace segmented by location where businesses can post expiring business listings and ads. 1​0. Manta is one of the fastest growing free online business listing sites. 1​1. Foursquare is a social business listings platform with free and paid features. 1​2. MapQuest helps customers find directions to your small business and has free and paid packages. Social media is one of the most powerful marketing tools for small businesses. Creating social media profiles is a critical first step, but you also need to maintain a presence on the platform and interact with your audience. 1​3. Buffer is a social media management tool that helps small businesses schedule social posts on various social networking platforms. The free version lets you schedule up to 10 posts for each social network. There are premium features and analytics available, too. 1​4. Hootsuite is another social media post management tool that provides small businesses a limited free option for scheduling posts and tracking engagement on social media. There are upgrade options for businesses that need more versatility and insight. 1​5. TweetDeck is a powerful free marketing tool for managing business profiles on Twitter. You can customize your Twitter experience and manage your lists and tweets efficiently on the platform. 16. If-that-then-this (IFTTT) is a free platform that lets users connect their various web applications and create logic-based actions. It’s a useful tool for social media marketing because you can set automated actions and alerts on and for your social profiles. 1​7. Socialoomph is a free social media productivity tool for small businesses to plan social posting, track trends, and assess engagement on their social accounts. 1​8. Social Mention is a social media search engine that aggregates posts from a variety of social platforms into one area so you can easily monitor your brand. 19. Followerwonk is a database to find, track, compare, and analyze Twitter users. There is a limited free version with premium upgrades. 20. SumAll is a new social media software that provides automation tools for social media with analytics and engagement data. 21. Google Alerts is a free tool that sends email notifications to small businesses when content about your brand or specific topics are published around the internet. 22. Friends+Me is free social post management software that works with popular social sites like Facebook, LinkedIn, and Twitter. 23. ManageFlitter is a follower management tool with a limited free option that lets you easily analyze and unfollow inactive or spam users on Twitter. 24. Social Pilot is a social scheduling and analytics tool that is easy to navigate. There is a free plan and various premium options. Content marketing is the digital marketing discipline that uses content to attract, convert, and retain customers. The best approach to content marketing is to integrate onsite and offsite content strategies into your total digital initiative. 25. WordPress is the ultimate free content marketing tool because it is the world’s most powerful content management system (CMS). More than 10 million websites are built using WordPress. 26. HubSpot's Blog Topic Generator is a free idea generating tool that helps small business come up with new blog article topics, which are an integral part of content marketing. 27. Canva is a free graphics editing software. Small businesses can use Canva to create stunning social images, featured illustrations for articles, and other digital marketing assets. 28. CoSchedule’s Headline Analyzer is a free tool that assesses and scores your headlines to increase the click-through and effectiveness of your content’s headlines. 29. Stencil is a free image editing tool for social media. It has more than 1,500,000 royalty-free images that small businesses can use to increase their social post engagement. 30. Grammarly is a content quality tool that helps small businesses edit content to improve grammar and fluidity. It has both free and premium features. 31. Feedly is a powerful content marketing tool that helps you organize and manage content from around the web based on your custom categories. 32. YouTube is a free video content management platform. It’s the second largest search engine in the world, so small businesses should find ways to integrate video into its content marketing strategy. 33. Quora is a free Q&A platform that can help small businesses find topics to write about. 34. The Hemmingway App is a free copywriting tool to help you improve the coherency and quality of your content. Email marketing is one of the best communication strategies for small businesses. From lead nurturing to customer relationship management, email marketing can help your small business drive more engagement from your email lists. 35. MailChimp is arguably the most popular email management service available. You can add email lists, create marketing emails, and track activity on your various campaigns. It has a robust free version with upgrades as needed. 36. Sumo is software that provides free tools to improve the optimization of your website traffic. One of their free features is an email list building tool that helps small businesses collect emails from website visitors. 37. VerticalResponse is another email marketing management software that uses a freemium business model. Send up to 4,000 emails to 300 contacts every month for free. 38. Gorgias Templates is a Google Chrome Extension that allows users to create custom templates for Gmail. 39. LinkedIn Sales Navigator Lite, formerly Rapportive, is a free Google Chrome Extension that helps you find email addresses and details about contacts via Gmail. 40. MailJet is a free email marketing management tool with no contact limits on the free plan. It’s a simple interface for small businesses to get started with email marketing. Search Engine Optimization (SEO) is the digital marketing discipline that involves onsite and offsite tactics for increasing a website’s organic search rankings. From link building to URL architecture, there are hundreds of factors that affect a small business’ search rankings. 41. The Yoast SEO plugin is free and can be installed on WordPress websites to analyze and improve organic search rankings. 4​2. Google Analytics is a free search data tracking tool for small businesses to monitor and assess their various SEO initiatives. Measure onsite engagement, referral sources, and unique visitors among other data points on this powerful resource. 43. Google Webmasters is a resource for web admins to help manage and improve a website’s presence on Google’s platform. It’s arguably the most important resource because it indicates errors and helps SEOs improve the technical efficiency of a site. 44. ​Bing Webmaster Tools is a free resource that helps small businesses optimize their site to improve rankings in Bing’s results pages, which account for more than 20 percent of all searches online. 4​5. Google Trends is a free resource that shows insight into topical search trends on Google which can help small businesses create content that is optimized for more search queries. 46. SEMRush has a very limited free version, but it’s one of the most popular tools for tracking and assessing a site’s organic rankings. While the premium versions are robust, the free features can still help small businesses improve their SEO. 4​7. Screaming Frog’s SEO Spider Tool is not for novice SEOs. This free onsite crawler helps technical SEOs improve the optimization of their website’s pages. 48. Google Keyword Planner is a free resource for users who create a AdWords account with Google. This resource shows keyword trends which is an important step when conducting keyword research for SEO. 49. Pingdom Website Speed Test is a free tool to help you check the load time of your website—an important factor for a site’s organic rankings—in various locations across the world. 50. HARO, Help a Reporter Out, is a resource created for journalist, but extremely valuable link building tool for small businesses. You can sign up for free as a resource and can potentially receive mentions on reputable sites like Mashable, Reuters, Fox News, and The New York Times. 5​1. BuzzStream built a free tool to help small businesses build a list of outreach targets based on the blogroll of another website. 52. Google Search Console, currently in BETA, is a free tool within the Google Webmaster’s resource deck that provides more detailed insight about organic search from a website. 53. Link Explorer by Moz is a link analyzer and competitive research tool that has a free version for Moz users. 54. Keyword Tool is a free SEO tool to help small businesses build their keyword lists. 55. MozBar is a free SEO toolbar with more than 420,000 installs. With the MozBar, you can quickly assess the SEO metrics of any website. Small businesses need all the help they can get to compete with the bottomless marketing budgets of many large corporations. Using the 55 free digital marketing tools above, your small business can start improving its market share.